Perry has been planning a fly-fishing vacation in Scotland for three years, and this time he�s going to let nothing stand in his way. But Della tells him there�s a client waiting outside that he'll fall in love with. When he sees seven-year-old Peggy Smith, he does. Peggy lives at a boarding school and is searching for her identity, since she has no idea who her real parents are. A search of birth records leads Perry to believe that Peggy is the daughter of Clark Lawson and Margaret Jeffers Lawson. Margaret was the daughter of wealthy Courtney Jeffers, a crotchety old man who disowned Margaret after she eloped. Margaret died shortly after Peggy was born. Jeffers relents when he sees Peggy and quickly embraces her, even changing his will to leave everything to her. The next day, Jeffers is found dead, killed with a poker. Now Peggy gets involved helping another member of the family to be cleared of Jeffers�s murder�a unique episode with a melancholy ending. Fans. will spot John Banner, Sergeant Shultz of Hogan�s Heroes, in this episode. Anomaly: Jeanette Nolan, listed as Emma Benson, is called Martha on two occasions and Mrs. Benson the rest of the time. 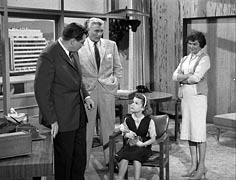 Laurie Perreau makes her only appearance on Perry here playing the lead role, Peggy Smith. Laurie Perreau had a very abbreviated acting career in the 60s, but most people remember her more famous sister Gigi Perreau. Gigi Perreau, who also appeared in two episodes of Perry was a very active child actor in movies and on television. Submitted by PaulDrake 33, 21 August 2009. The venerable Eleanor Audley makes her second appearance her. You may know her better as the voice of a wicked stepmother (Cinderella) or an evil fairy (Sleeping Beauty) in the movies. See trivia item for episode #42, TCOT Pint-Sized Client. Curiously enough, in both episodes, Mason�s client is a child. Submitted by gracep, 10/25/2010. Frances Helm who played Helene Osborne in this one, was first married to Brian Keith. They subsequently divorced after 6 1/2 years and on the same day they divorced (06/23/1954), Brian Keith married his 2nd wife Judith Landon. WOW! Submitted by mesave31, 05/07/15. The Jeffers family patriarch is played capably by Francis X. Bushman, a big star in silent films. Wikipedia tells us he drove horses and chariots in the first Ben Hur, and was billed as "The Handsomest Man on Hollywood" before that title was conferred on Clark Gable. 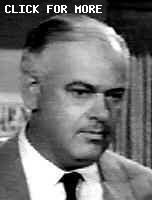 Mr. Bushman also appeared in TCOT Flighty Father, episode 95, as the elderly uncle (and later appears in episode 199, TCOT Nervous Neighbor) and plenty of other more modern movies and TV. JohnK, 5 October 2015. Sightings: If you are lucky you might catch a glimpse of �Miss Carmody� and Distinguished Gentleman #1 in the courtroom gallery. Find out who they and other regulars are, and the mystery behind them, here. Submitted by gracep 10/25/2010. +After the first court break, we find the Little Old Lady in the Hat and Distinguished Lady #4 in the back row viewing the action. Bill767, 1/3/16. Two cups from the Curious Coffee Set make an appearance in the restaurant in Geneva. More info here. Submitted by daveb, 12/30/10. (b) the furthest away is definitely a medium-colored Volkswagen Beetle. These cars indicate the strong and growing demand for small economy cars in the US at that time, a demand that was largely filled by European automakers. Assuming that the Staff parked behind the school, it appears that the average visitor to Westcroft didn't drive a Caddy. Added by Gary Woloski, 9/22/12. Location: The building in the opening shot is Los Angeles City Hall. At the time of the original airdate of this episode, this edifice was the tallest building in L.A. We see it in nearly every episode through Perry�s office window, and it is frequently seen in many other TV series, including Dragnet. + And fans of the '50s TV show The Adventures of Superman will recognize it as the Daily Planet building. Submitted by francis, 9/03/14. TCO Extraneous Europe If I am not mistaken, this is Perry's first trip "overseas" - he had earlier journeyed to Canada and Mexico - and with the little they do with it, one wonders why the script writers even bothered (though perhaps the cliche of Swiss secrecy might be considered an excuse). In Perry's two subsequent returns, the European setting will become a key part of the action, but here there's just a stock establishing shot of Geneva, a few indoor scenes and another stock shot of a return flight home (a Super Constellation prop-plane, no less...a concession to plausibility for a series that just a few episodes back had a character flying from LA-Carmel on Pan Am !!) Submitted by Notcom, 111915. As Perry is leaving his office for his trip, Paul says, "Perry, it's getting late; we'd better get going." Perry then says, "Have you got the tickets, Della?" and she responds "right here" as she removes the tickets from an envelope. Perry then picks up his briefcase, Paul picks up Perry's suitcase, and they both depart, leaving Della still holding the tickets. Submitted by Dan K, 11/30/16. + It looks like airplane seating was just as cramped back then as today. Perry is spilling over into Linda Osborne's space causing her to be squished. Submitted by Kilo 8/14/2017. Just as the Brent Building magically has balconies from the inside but none on the outside, the very traditional courtroom shown here bears no relation to the Mid Century modern building that supposedly houses it. I think this is one of the most unusual, and memorable, episodes of Perry Mason. The pathetic--and creepy--little girl (I half expect her to order her dolls to attack someone! ), Linda Osborne's shocking reaction to her, Mr. Kringle, the beheaded doll...lend an almost Twilight Zone-ish feeling to this episode. Submitted by 65tosspowertrap, 9/16/2013. I'm sorry, but I can't resist: when A. Tobler (John Banner, Sergeant Shultz of Hogan�s Heroes) refuses to disclose any information about the account set up for Peggy, he might as well say, "I know nothing! Nothing!" Submitted by 65tosspowertrap, 9/16/2013. The exact same thing - life got in the way. It's scenes like those that drive home what kind of people Perry, Della and Paul truly were and how often they sacrificed their own needs and pleasures to help others. I was very happy when the writing in the first season changed to show the respect Perry and Tragg had for each other. All four of those characters were real people; unlike Burger, who was nothing more than a sad caricature whose whole existence revolved around desperately needing to 'one up' Perry at every turn - even to the point of sacrificing true justice. It's almost as if Hamilton's whole train of thought was "uh-oh, Perry has a new client, I need to charge them with murder!" Submitted by Arisia, 03/10/18.